AJ McCarron can’t be mad at this comparison. 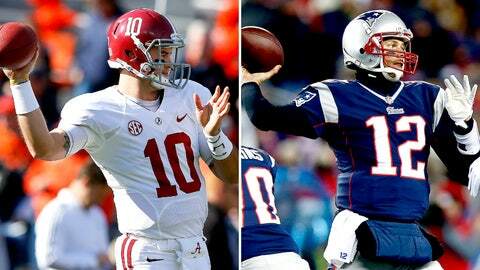 As the Alabama senior puts the finishing touches on his collegiate career, one AFC college scouting director is ensuring that the two-time national champion’s draft stock skyrockets, comparing McCarron to one of the best quarterbacks in the NFL: Tom Brady. While McCarron is surrounded by a talented class of quarterbacks such as Tajh Boyd, Johnny Manziel and Teddy Bridgewater — all thought to be among the top prospects in the upcoming draft — Breer even went so far as to say that McCarron could be the first QB selected. Regardless of where he goes in the draft, though, McCarron will certainly have big shoes to fill if he is to be the second coming of the New England Patriots quarterback. Brady is a three-time Super Bowl champion, two-time Super Bowl MVP and eight-time Pro Bowler and has a plethora of records to his name. McCarron has a way to go before putting up those kinds of numbers and being widely considered an elite quarterback in the NFL, but the young quarterback can worry about graduating college first and living up to those slightly insane expectations second.